Kids love to play with the new Dinosaur Train Interaction Toys with SmartTalk technology by Learning Curve. Based on the hit PBS Show from The Jim Henson Company, these fun and educational toys actually recognize and talk to each other. •Based on the iconic character from Jim Henson’s Dinosaur Train television series. •SmartTalk technology gives the InterAction Dino's the ability to recognize and interact with other dinosaurs in the line—just press his button and he’ll share tons of fun Dino data. B is the ULTIMATE Dinosaur fan! He LOVE'S Dinosaur Train (which airs on PBS in the morning here-check your local listings) and he never misses an episode! The princess (who is the girliest little girl you'll ever come across;) even gets into it. How can you not with the adorable animation?! There's so much to learn on Dinosaur Train as well (I love that this show teaches them so much), at their young ages my children know more about Dinosaurs than I do! B was naturally super excited when I introduced him to the InterAction Boris and Spike (Boris pictured above, Spike pictured below) by Learning Curve. By simply setting them in front of each other, they talk and interact (through SmartTalk Technology), they created a display that left both the Princess and B with their mouth's wide open......the princess still says "it's magic" when they start talking to each other. B and the princess have had a wonderful time listening to all of the Dinosaur facts they talk about and the conversations their two new friends have! They're funny, adorable, and my favorite part? They have tons of knowledge (Dinosaur Facts) to bestow upon my children. 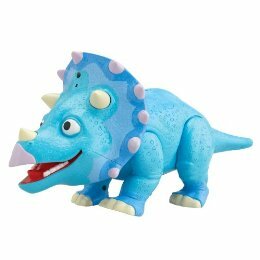 We absolutely love Dinosaur Train InterAction Dinosaurs! B now wants to collect the other's; can't wait to hear what they all have to say to each other when the gangs all here! 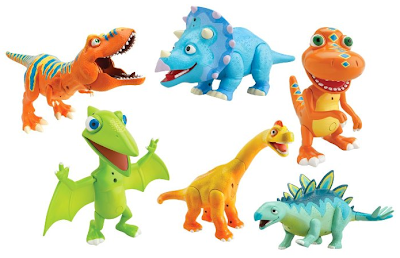 Dinosaur Train InterAction Dinosaurs make the PERFECT Holiday Gift! Bring home these adorable Dinosaurs this Holiday Season! 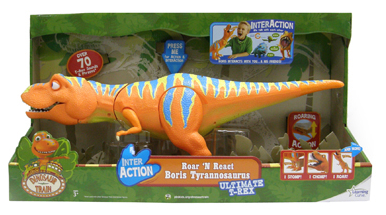 One Lucky Reader will receive a Dinosaur Train InterAction Boris! Leave a comment~ Visit http://www.learningcurve.com/ and let me know which other Learning Curve item you'd love to gift or receive this Holiday. The comment is considered your entry. I would love to get the Boulder Mountain Set from Thomas the Train for my youngest boy for Christmas. Subscribe to your rss feed through google reader.